You will need Node 6+ and Yarn installed on your machine. Writing automated tests is very important in any real world project, but it can been notoriously difficult to figure out especially in the frontend world. To follow through with this tutorial, you need Node.js (v6 and above) and npm installed on your machine. 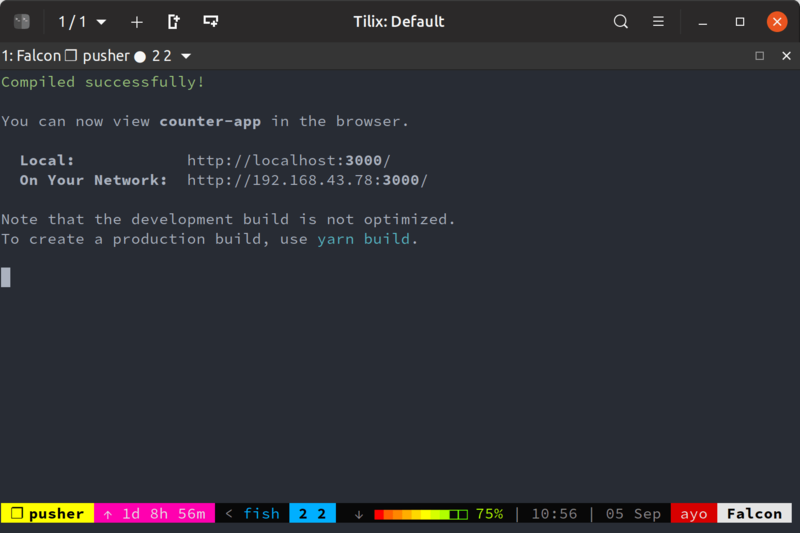 You also need to install yarn since that’s what create-react-app uses. Before we can write any tests, we need to create an application we can test. We’ll create a simple counter app that increments a count once a button is clicked. Let’s bootstrap the project with create-react-app so we can get up and running with minimal fuss. Once the application has been created, cd into the counter-app directory and run yarn start to launch the development server. You should see a message confirming successful compilation and the ports where you can access the app. Our React app has some initial state count which is set to zero, and a button that, once clicked, increments this count state through the increment function which simply adds 1 to the value of count and updates the application state. Normally, we’d need to install and configure Jest before writing any tests, but since create-react-app ships with Jest already installed, we don’t have to do any of that. We can jump straight into writing our first test. If you look at the src/App.test.js, you will see that a test has already been written for us. It tests that the App component can render without crashing. 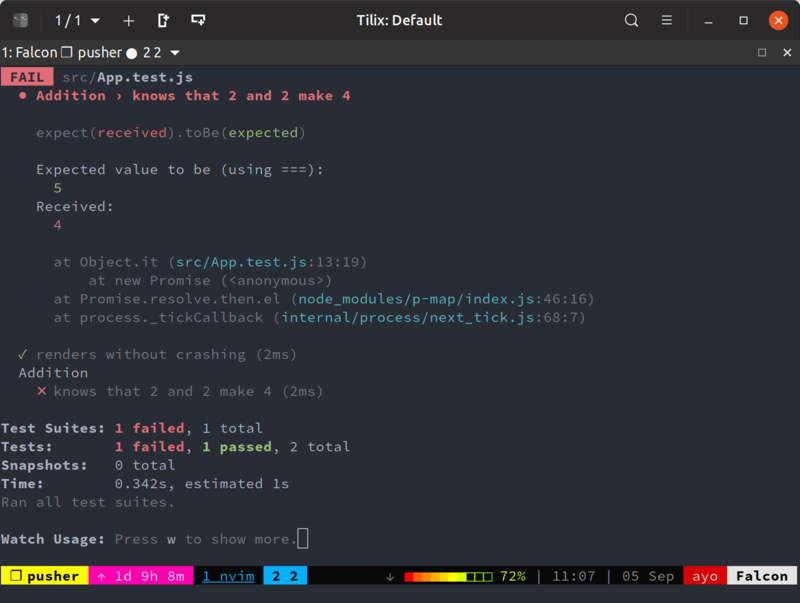 Check your terminal output. You can see that the first test passes as before while the second one fails, and the reason for the failure is also printed. A describe() function groups related tests together inside one test suite. It takes a name parameter, which should describe the component you’re testing, and a callback function where individual tests are defined with it. 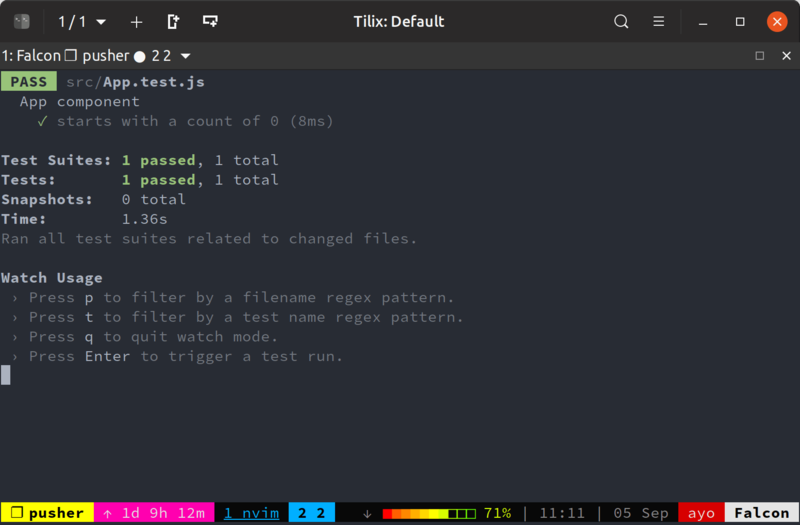 You might see individual tests with test in some projects. To be sure, it and test are one and the same thing. it is only an alias for test. What you want to test is wrapped in a call to the expect() function, before calling what is termed a “matcher” function on it. In the above example, toBe() is the matcher function used. It checks that the value provided equals the value that the code within the expect() function produces. Enzyme is built to support different versions of React. In this tutorial, I’m using the latest stable version of React which is 16.4.2, but you might be working with an older version of React, say React 15.x. So you also have to install an Adapter that corresponds to the version of React that you are using. You also need to create a setupTests.js file within your src folder that tells Jest and Enzyme what Adapters you will be making use of. create-react-app has been configured to run this file automatically before any of our tests, so that Enzyme is set up correctly. We’re taking advantage of Enzyme’s shallow rendering to test our app’s initial state. A shallow render is a simulated render of a component tree that does not require a DOM. It renders only one level of components deep, and enables the inspection of the component’s contents as well as the simulation of user interaction. In the above snippet, the shallow render of our App component is stored in the wrapper variable. We then grab the text inside the p tag within the component’s output and check if the text is the same was what we passed into the toEqual matcher function. Let’s go ahead and write a new test that simulates a click on the button and confirms that the count output is incremented by 1. The simulate() function on the button variable can simulate a number of DOM events on an element. Here we are simulating the click event on the button. We’ve also set up an expectation that the count should be equal to now. 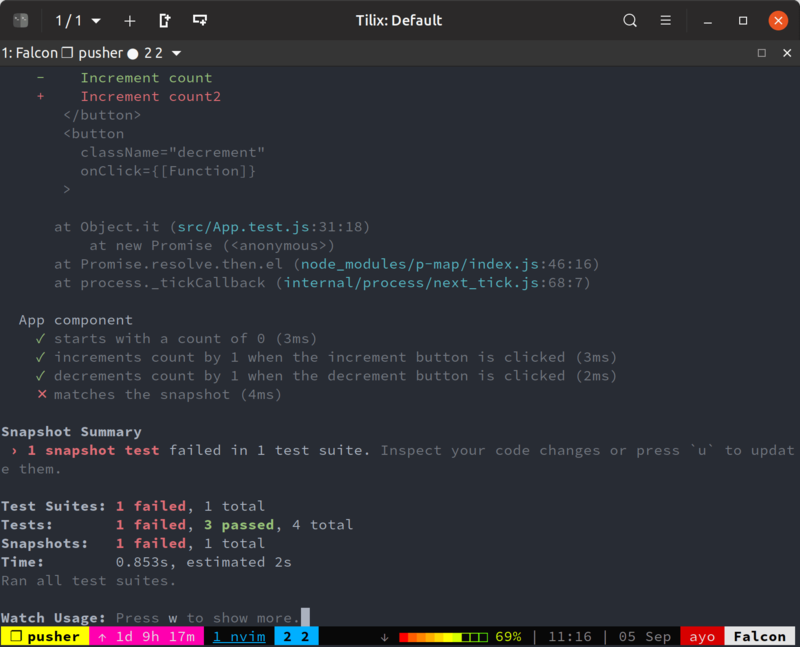 If you check the terminal output, you should observe that the test passes as expected. Let’s go ahead and do something a bit different. We’ll add a test for some functionality that doesn’t exist yet, then go ahead and write the code to make the test pass. This methodology of writing tests before the code is known as Test Driven Development (TDD). 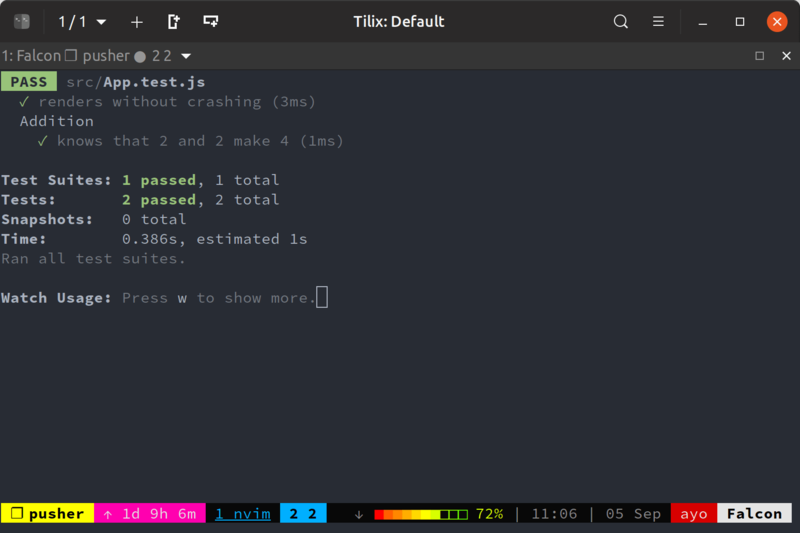 Now you should have a failing test in the terminal: Method "``simulate``" is only meant to be run on a single node. 0 found instead. If you’re not used to Enzyme, you might find the error message rather cryptic. What it means is that the simulate() method was called on an element that doesn’t exist yet. We added a decrement button after the increment button in the render() function and a decrement() function that decreases the value of count by 1 and updates the application state. At this point, all three tests should pass successfully. Snapshot testing helps you check that the rendered output of a component is correct at all times. When you run a snapshot test, Jest renders the React component being tested and stores the output in a JSON file. On further test runs, Jest will check that the output of the component has not deviated from what it saved previously. If you change the a component’s output, Jest will notify you and you can either update the snapshot to the latest version or fix the component so that it matches the snapshot again. 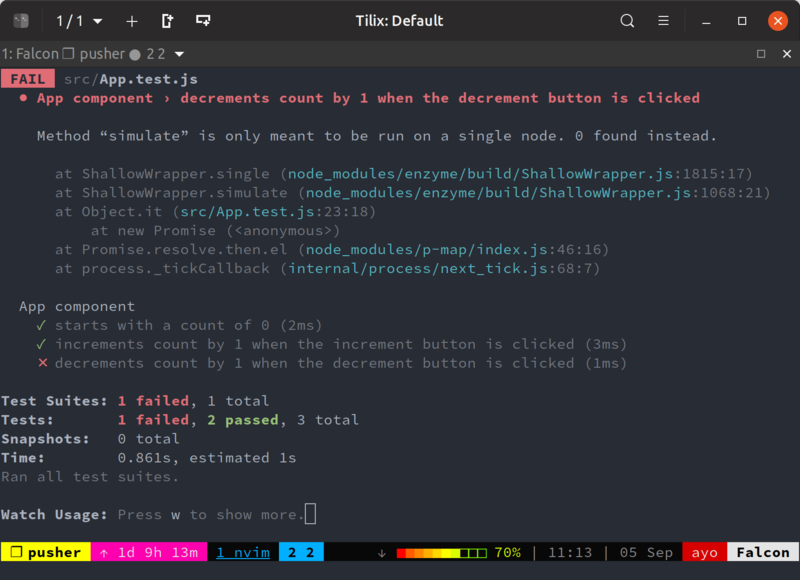 This method of testing components helps you avoid accidental changes to your components because Jest will always notify you when a difference is detected. The first time this test is run, there is no snapshot for this component so Jest creates it. You can inspect the contents of the snapshots inside the src/__snapshots__ directory. You can see that the rendered output of the App component is saved in this file. The next time this test is run, Jest will confirm that the outputs are the same. We can demonstrate this concept by changing the rendered output of App slightly. Let’s assume that we accidentally changed the text of the increment button in App.js to Increment count2. The test should fail. Since we didn’t intend to make this change, we can simply undo the change and the test will pass again. The tests should fail again. But since we actually intended to make this change, we need to update the snapshot to this latest version. We can do so by pressing u in the terminal window where the tests are being run. Everything should be green again! We’ve looked at how Jest makes testing React components much easier and how you can use it in conjunction with Enzyme for unit testing and snapshot testing. You can grab all the code written in this tutorial on GitHub for you to check out and run locally.